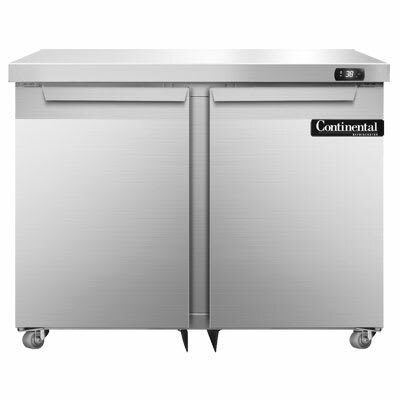 The Continental Refrigeration SW36-U undercounter refrigerator has front, top, and end panels constructed of durable stainless steel. Resistant to corrosion, the back and interior are constructed of aluminum. Polyurethane foam insulation locks in cold air, and the two self-closing doors are sealed with magnetic, snap-in gaskets. Two epoxy-coated, steel shelves maximize storage space. 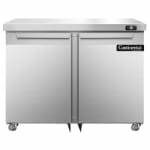 The Continental Refrigeration SW36-U undercounter refrigerator has a rear-mounted, self-contained refrigeration system that eases maintenance. It has an electronic controller that is equipped with digital display and high-low alarm. An automatic condensate evaporator is non-electric to conserve energy, and the fin evaporator is plasticized to resist corrosion. Check out this resource on undercounter refrigerators guide to learn more about undercounter refrigerators.